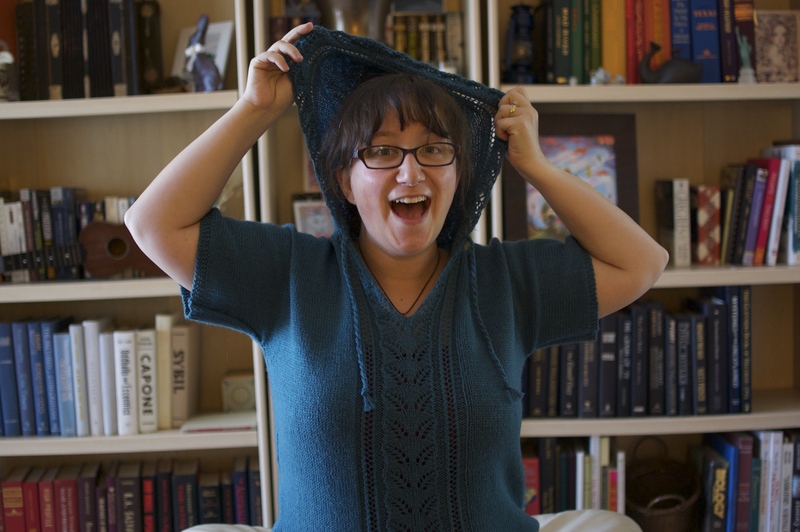 Wow – I thought I’d never finish knitting this hooded, short-sleeved sweater! 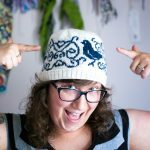 I started knitting the Kelso sweater in May, so it took almost 6 months to complete. Now that I say that out loud, I’m surprised I knit my first sweater in less than a year. Yeah, I’m using a remote control. What of it? Knitting this was pretty fun. The lace panel in the middle uses the SAME pattern repeat every row (knit or purl), so it’s very easy to remember. There is some seaming to do, which I was dreading because everyone talks about how awful seaming is, but I actually found it to be a bit fun to watch the mattress stitch zip up the sides of the sweater. I also learned how to do the kitchener stitch for the top of the hood! I do wish that I’d knit a smaller size. I chose the 46″ size based on my bust size, adding 4″ for ease and it’s a bit swimmy in here. After reading Knit to Flatter and Knit Wear Love by Amy Herzog (the sweater queen, IMO), I now know that I should knit sweaters based on my upper torso size, adding darts where needed to increase sizing where things are a bit bigger. That would have meant making a 38″ instead of 46″ sweater. The hoodie helps a lot to make this sweater look cute at a bigger size. Without it, it might just look like a big, frumpy shirt. Does this sweater make my bookshelves look big? My only gripe with this pattern is that it called for 8 balls of yarn and I only needed 5.25 of them to finish the sweater at the size I chose. Maybe I knit weird but I swear I met gauge! On to the yarn. I knit this using Knit Pick’s Palette. I absolutely LOVE the colors available in this yarn base. It’s 100% wool and 100% stinky when wet. Luckily the smell goes away after a bit, otherwise this sweater would be in the trash. I didn’t particularly love or hate knitting with the yarn, but it is a very nice match to this pattern. Woohoo! Now I can cast on something else! Or perhaps I should finish that shawl… or sock. Girl, look at that hoodie. I work out! Very cute, nice job! Being one who got only as far as headbands, it would take me forever to knit that. Thank you! I’ve been knitting for 7 years and finally got the courage to cast on a sweater. With a few extra techniques, knitting a sweater isn’t much more difficult than a headband, just much more time consuming! Next PostNext Cross Stitch Cuteness!